Dianella caerulea var. assera R.J.F.Hend. Description: Plant tufted, solitary, to 1.8 m high. Stems elongating, with scales for most of their length; extravaginal shoots produced distally. Leaf sheaths more than two-thirds occluded distally, ± biconvex in cross section in that region. Leaves not glaucous. 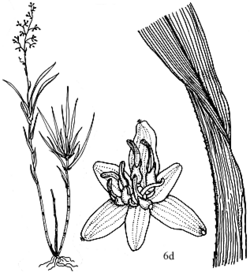 Inflorescence conical to narrow-cylindrical in outline. Cymules expanded or contracted, few-flowered. Perianth pale to mid-blue, often with green streaks externally. Distribution and occurrence: Coastal districts north from Nowra, extending west to the Blue Mtns and Tenterfield district. Mostly grows at higher altitudes, often associated with rainforest.